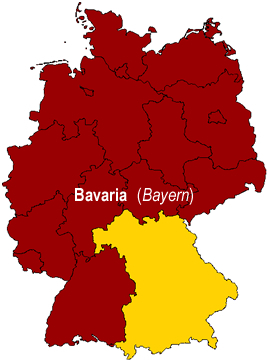 The state of Bavaria (Bayern) lies in the south-eastern part of Germany. It is the largest state in size, and it is the second most populated. Bavaria is bordered by the German states Baden-Württemberg, Hessen, Thuringia (Thüringen), and Saxony (Sachsen). To the south, it is bordered by Austria and Switzerland; to the east by the Czech Republic. • numerous urban centers offering traditional festivals (such as Oktoberfest), shopping opportunities, night life, museums, theaters, and more. Three regional styles of cooking are found in Bavaria. Bavarian cooking is hearty and rustic, making very simple ingredients into tasty, satisfying dishes. It is known for its wide variety of wurst (sausages), meat dishes, Knödel (dumplings) and pasta dishes, as well as for its breads, its sweet dishes and its dessert. Bavaria is known as the "Weisswurst Equator." The Weisswurst was created in Munich (München) on February 22, 1857, and has since become a very imporant part of Bavaria cooking and lifestyle. The Weisswurst is so important here that a number of "rules" and taboos have been created around this popular dish (listed below). Those who don't follow these rules are quickly labeled as "Foreigners (Non-Bavarian). 1. The Weisswurst must never be eaten with fork and knife. Instead, one is supposed to cut it in half, and with the hands, pick up one of the halves and dip it in sweet (and only sweet) mustard. The Weisswurst is to be eaten only with the hands. 2. The Weisswurst is to be eaten only with a roll or pretzel and sweet mustard - no other side dishes are acceptable. 3. The Weisswurst cannot be eaten after 12:00pm. This rule actually goes back to the 1800's when the wurst was first invented. Back then, there was no way to preserve or refrigerate fresh, uncooked wurst. Because of this, all Weisswurst that was made had to be eaten quickly, so the rule was created that the wurst could not be eaten after 12:00pm to avoid any food illnesses. Wheat also plays an important role in Bavarian cooking. This is evidenced by the numerious noodle and Knödel (dumplings) dishes, as well as the great variety of cakes and breads. Bread is not only eaten for breakfast, it is also used as filling in Knödel, poultry, and roasts. And we cannot forget about the world famous Pretzel. 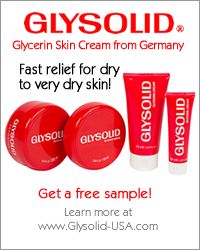 Its invention is accredited to the Bavarians. 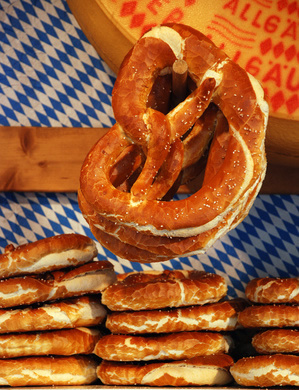 The pretzel isn't just a side to wurst dishes, it is also an important part of festivals (such as Oktoberfest) and holidays. Meat dishes are mainly of beef, veal, or pork. Poultry is also gaining in popularity. Historically, meat was only served on Sundays because many couldn't afford the cost of serving meat everyday. The exception to this was in the city of Munich (München), where people were wealthier and could afford a piece of beef daily. Veal, however, was saved for weekends only there. Frikadelle (Seasoned Beef Dumplings) - Also called "Fleischpflanzerl"
The five largest cities (in terms of population) of the state of Bavaria (Bayern) are listed below. Munich is the capital city of Bavaria. Its population (as of September 2006) is 1.3 million, making it Bavaria's largest city, Germany's third largest, and the European Union's eleventh largest. The city is one of the most important economic, tourism, and cultural centers for Germany. Munich is well-known for the Oktoberfest, which is held from mid-September to the first Sunday in October. economic and cultural center of Northern Bavaria. the Roman Emperor (Kaiser) Augustus. watch activity on the Naab and Regen rivers. This fort held between 500 to 1,000 soldiers. Würzburg is Bavaria's fifth largest city, with a population of 128,000 (as of March 2006). It is located on the Main river. In 2004, it celebrated its 1300th anniversary.